Coleraine players celebrate after Darren McCauley scored to make it 3-0 against Glentoran. 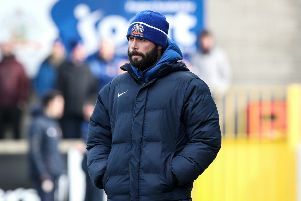 Coleraine ramped up the pressure on Alan Kernaghan as they hammered Glentoran at The Showgrounds. The rampant Bannsiders swept aside the Glens with the visiting support venting their displeasure at the manager. Neil McCafferty gave the home side the advantage in the first half, before a devastating nine minute spell after the break killed the game off. James McLaughlin helped himself to a brace after the impressive Darren McCauley scored a great solo effort. The home side broke the deadlock on eight minutes after McCafferty slotted home from the spot. The decision looked harsh on keeper Elliott Morris who looked to have taken the ball as McLaughlin burst through. The Bannsiders should have been awarded a penalty minutes earlier though as Johnny Addis clearly pushed Ian Parkhill in the box. It was nearly 2-0 on 18 minutes but for an unbelievable goal line clearance from Curtis Allen to keep out Brad Lyons’s header. The Bannsiders extended their leadon 54 minutes as Rodney Brown fed McCauley who coolly slotted past Morris. Two became three minutes later as McCauley teed up McLaughlin, who finished with aplomb from eight yards out. Coleraine were running riot and McCauley set up McLaughlin for another on 63 minutes. Jonathan Smith pulled a consolation goal back for the visitors with nine minutes to go. Coleraine: Johns, Kane Brown, Ogilby, Douglas, McCauley (Mullan 90+1), McCafferty, Kee, Lyons, Parkhill (McGonigle 79), McLaughlin (Moorow (90+1). Subs: Higgins, McConaghie. Glentoran: Morris, Birney, Magee, Addis, Novo, Allen, Redman, Gordon (Harmon 56), Nelson (Smyth 58), Lavery, Foley.